Anchored Series at CAC Denver. Keeping Families Safe & Saved. If ever the world, the church, and the family needed a rally cry for apostolic relationships, anchored in scriptural principles, it is now. 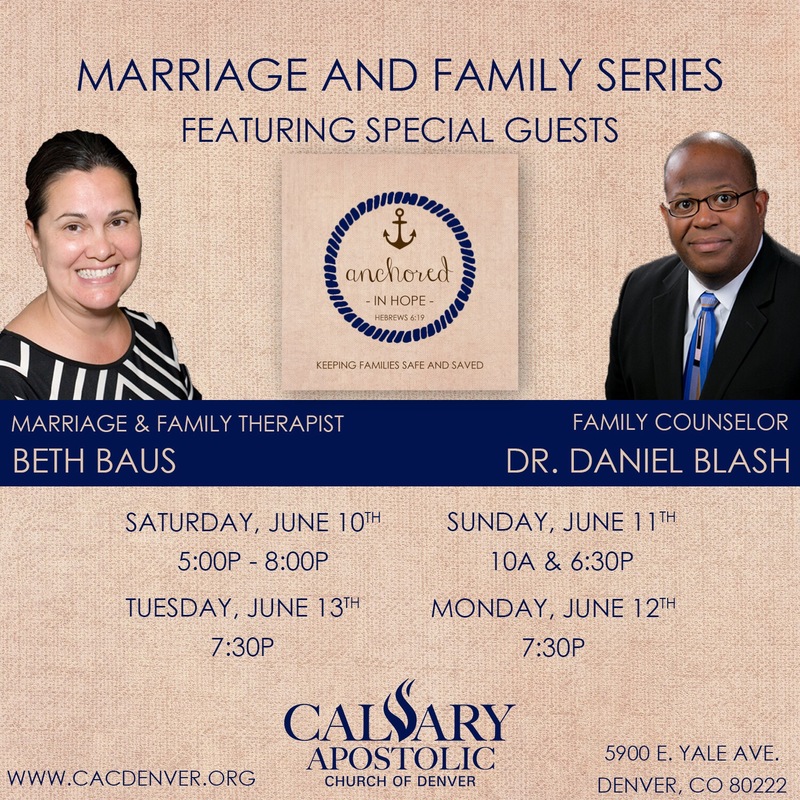 Beth Baus, LFMT, (San Bernardino, CA) and Dr. Daniel Blash, PhD, (St. Louis, MO), will speak to the need and the blessing of Bible-based relationships. You will be inspired, guided, and refreshed as these Spirit-filled, licensed, and professionally active counselors lead us in achieving balance and health in our individual lives and our communities. After all, isn’t it in the boundaries, peace, and love of our relationships that we find true definition as Jesus’ disciples? Sunday, June 11th 10:00 am; 6:30 pm. Nursery (ages: infant – 4) provided for all sessions. Childcare (ages: 5-12) provided in CAC Dining Room for Saturday, Monday, and Tuesday sessions. Please bring quiet entertainment.